Synopsis: With its breathtaking vistas and down-to-earth people, Thunder Point is the perfect place for FBI agent Laine Carrington to recuperate from a gunshot wound and contemplate her future. The locals embraced Laine as one of their own after she risked her life to save a young girl from a dangerous cult. Knowing her wounds go beyond the physical, Laine hopes she’ll fit in for a while and find her true self in a town that feels safe. She may even learn to open her heart to others, something an undercover agent has little time to indulge. My take: I think fans of the Thunder Point series are going to love this book. I did! 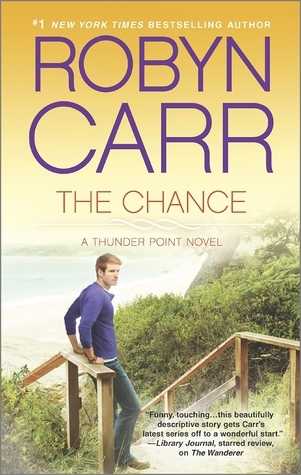 We met Laine and Eric in previous books (as secondary characters) and I’m so glad Robyn Carr gave them their own book. Laine is taking stock of her life after a life-changing event and Eric is seeking redemption from his earlier life. In fact, he’s probably already found redemption and is on the path of making people wonder if he was ever that person. What they need to find out is if they can continue to live a new life with each other. What they don’t expect is the knock at the door that will change their life. No spoiler but I have to say Carr really nailed the heartbreaking issues involved with this storyline. Then we have secondary characters, most of whom we’ve met in earlier books: Al who has worked for Eric several times but never stays very long. He’s a good person so Eric is always glad to have him back. Ray Anne, who becomes Al’s love interest, has been around the block a few times. These two were fun to watch as they fell in love. They’re older (50-60ish) than the usual romance couple. I love that and wish Robyn Carr would write more for that demographic. She’d find lots of fans, I’m certain. This couple’s storyline will arc into the next book. At least it better! My one issue with the book was the abrupt ending. I’m ok that strings weren’t tied in bows as long as those strings find their way into book 5 🙂 There’s also the three brothers who’ve been split up due to their mother’s terminal illness. They are part of Al’s story that will hopefully be broadened in the next book. Like I mentioned, I loved this installment of the Thunder Point series. I’m really looking forward to the next book.